Bronze pin for your first fish of merit. Silver pin for your fifth fish of merit. Gold pin for your tenth fish of merit or a new state record fish. Top Angler Awards are given to Marine and Inland anglers who catch and keep (Harvest Fish), catch and release the largest fish of each species categories. Angler of the Year is awarded to the angler with the most species categories. Awards are provided at the annual Trophy Fish Award Ceremony. Youth Category is defined as anyone 15 years of age and under. Saltwater entries caught by boats leaving and returning to Connecticut ports. No overnight stays in another state prior to day(s) of fishing. Entries must be filed on the Official Affidavit Form, Trophy Fish Award Affidavit (PDF). Submission of false or misleading information may result in disqualification. Fish must be caught by legal methods, played by only one person. Fish must be entered within 30 days of capture. Fish caught in hatchery ponds are not eligible. Fish must be caught (including catch and release) during Connecticut’s legal open season. A clear photograph of the fish must accompany the Affidavit Form. Fish may be weighed at any local bait and tackle shop (see Connecticut Bait & Tackle Shops). Please note: all potential State Record Fish must be weighed on a certified scale and a printout of the scale weight must accompany the affidavit or an image of the scales certification number, date inspected, vendor name and inspectors name. The size of a potential trophy fish or state record fish can not exceed the maximum length for any given species (e.g. red drum). For species not listed: trophy fish award subject to Fisheries staff identification and review. All of the General Rules apply except that the fish does not need to be weighed. A witness must be present. A clear photo must accompany the affidavit. 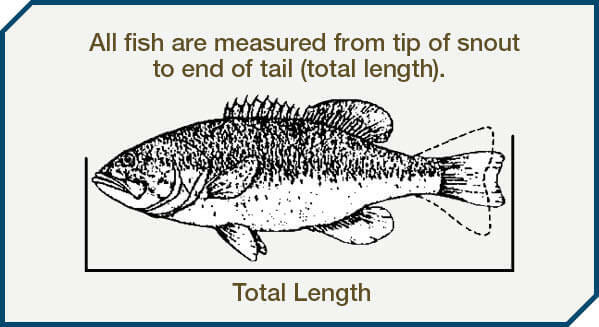 This photo must include the angler holding the fish and also include the fish next to a measuring (yardstick, ruler, or tape measure) device to clearly show the length of the fish. The accompanying photo must be taken at the location where the fish was caught and released. Fish can’t be taken from the site and then transported back. BLE = best length estimate for highly migratory species. Minimum Length (Total Length) = Tip of snout to end of tail. Marlin & swordfish—measure from lower jaw to fork in tail. Shark species—minimum length is fork length. Fish must be released alive! Note: Minimum Lengths apply to the catch-and-release category only! The minimum lengths listed below do not apply to the traditional weighed category. 1 Includes only hatchery-reared broodstock salmon released into the Broodstock Atlantic Salmon waters and supplemental lakes. Wild Atlantic salmon from the Connecticut River and Long Island Sound are illegal to possess and not covered under this Trophy Fish Award program. 2 A clear photo of the side of the fish required for identification.